Imagine yourself completely relaxed somewhere where you feel at peace: at the beach, in front of the fireplace at a mountain lodge or in your favorite chair at home. You have completed everything on your to-do list. You are not worrying about the future and not regretting the mistakes of the past. You are simply being. Have you ever felt like this before? When was it? On your last holiday, at Christmas five years ago or back when you were a child? Modern culture places value on doing, and busyness has become a badge of honor. When you are constantly doing, you feel that you are contributing, and, in your mind, this makes you a worthy member of your family, organization or community. Without a doubt, doing is important. However, constant doing leads to excessive stress, which forces to the body to direct all its resources to cope with the immediate situation and temporarily shut down other vital functions, such as digestion, healing and even thinking. Yoga gives you an opportunity to step away from doing and turn inwards, but then the practice ends, and you immerse yourself in busyness again. 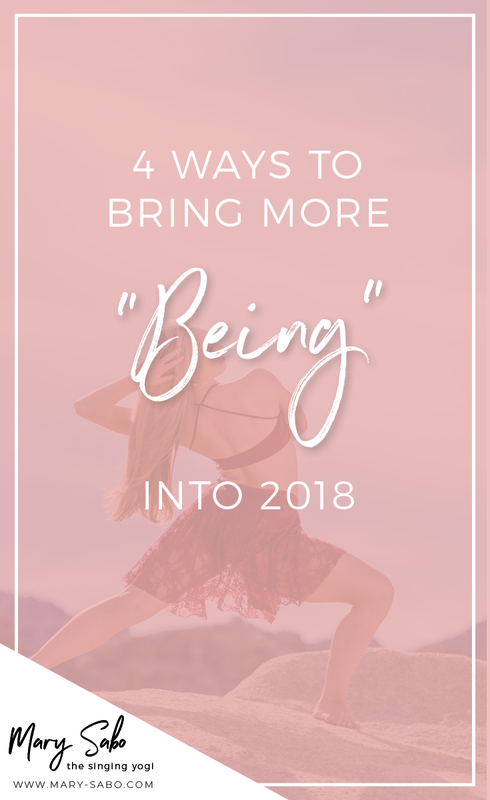 How can you take what you learn on the mat and sustain the sense of "beingness" throughout your day? Every hour or two, take time to stop and clear your mind. Become aware of your breath for a minute. Drink a glass of water while focusing on the weight of the glass in your hand, the sensations when the glass touches your lips, the water flowing through you. You can fit in your mindful breaks no matter what your schedule is. They do not take long and do not require any special skills, yet, when you regularly take a few moments to be mindful, you will notice that you are feeling more centered and peaceful. You are great at keeping track of everything that might go wrong and needs to be taken care of, but you often forget to acknowledge all the things that are beautiful, bring you joy, and make you feel good about the world and yourself. Gratitude grounds you in the present and has enormous benefits for your health, sense of well-being and relationships. It is easy to add gratitude to your day in a way that makes you feel good. Keep a journal, say a prayer, sing a joyful song in the shower, take photos to capture special moments, count your blessings before going to sleep or choose any other way to express gratitude that works for you. The purpose of restorative yoga is to achieve complete physical and mental relaxation through passive poses that require no muscular effort. Restorative yoga activates the body’s "rest and digest" response, which brings the body back to balance after experiencing stress. Here are some poses you could try. Lie on your back with your eyes closed and your legs up the wall. Same as above, but this time have your shins on a chair, parallel to the floor. Hold each pose (or one of them) for 5-10 minutes and notice how your body is becoming more relaxed and content. Similarly to anything else, it will take time before these practices become automatic for you. To make it easier, set reminders for yourself — a note on your desk, a picture on the wall, a message on your screen. Build your new habits by tying them to routines you are already doing. For example, every time you reach for your mobile, take a few deep breaths and find something to be grateful for. When you come home from work, spend five minutes in a restorative yoga pose to let the pressures of the day slide off. If you forget and skip a day, do not beat yourself up. Be gentle with yourself, and let whatever has happened to be okay.